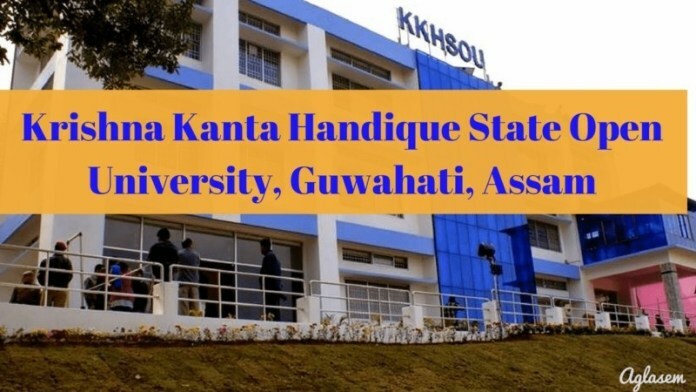 KKHSOU Result 2019 – Students are notified that Krishna Kanta Handiqui State Open University has announced KKHSOU Exam Result for exam held in January 2019. Students appearing or appeared in the Term End exam can check KKHSOU Result through the link provided in this page. The University releases the result for Regular and Re-Scrutiny separately. To qualify in the exam the students have to obtain 35% marks (which comprise the marks obtained from the term-end exam and home assignment) in each course. Students will be allowed to clear the Back subject/course in a maximum of 4 attempts. The students who are not satisfied with their result can apply for re-scrutiny. Students can even download their E-Mark Sheet online. Check the article for KKHSOU Result 2019. Latest: KKHSOU has released Re-scrutiny result of Degree Sem 5 Examination January 2019 and DELED 1st-year Examination December 2018. Also to check KKHOSU Exam Routine 2018 – Click Here. After the release of KKHSOU Result, students can even apply for Betterment exam or Re-Evaluation of the result. To apply for Betterment and Re-evaluation/ Re-Scrutiny student must submit the application form and fee within the prescribed time. The final year students qualifying in the Term End Exam can collect their Original/Provisional certificate. To get provisional certificate students must fill the application form. Check the table for the links to check the result. Click Here for D.El.Ed E-Marksheet. Students can check KKHSOU Result for Regular and Rescrutiny Result through the links provided below. Check the table for KKHSOU Result for the University Term End Exam / Semester exam. TO check KKHSOU Result click the link provided in the table. The table will be updated with the all latest result released by the university. The students can even check their result from the study centre and the official website respectively. To check KKHSOU Result 2018 from the official website follow the steps mentioned below. The students whose result is withheld, for the clearance of withheld result the student has to apply to the controller of the examination through the study centre along with the required documents. Students should apply within the 60 days from the result declaration date. To know about the required documents contact the coordinator of the Study Centre. The amount of Rs.1000/- is t be paid as a fine for the request for the declaration of the withheld results Check KKHSOU Result 2019after 60 days but before 90 days. After the deadline, no request shall be entertained. The University has provided the facility of downloading the E-Marksheet online. To download the E- Marksheet students have to provide few necessary and valid details. Check the steps for downloading the E-Marksheet and the information required for downloading the E-Mark Sheet. Visit the Official Website of KKHSOU, www.kkhsou.in. Then select the option Examination, then Result and click on E-Mark sheet. Then download your E-Mark Sheet. After the declaration of the result, students are not satisfied with the marks obtained they can apply for Re-Scrutiny / Photocopy / Re-Evaluation of the Answer Script. The student should fill out the application form. The form is available on the official website. One student can apply for a maximum of 3 papers only. The review of the answer script on demand will be allowed in the following steps. Step3.Re-evaluation (within the next one after the completion of step 2. The final Year Students who pass in the final semester/year examination in all paper in the courses selected can apply for the Original / Provisional Certificate. The photocopies of the enrolment card, admit card & all mark sheets must be enclosed with the application form. The students have to pay the prescribed fee through Challan. The form will be available in the Study Centre.